EL MONTE – When South El Monte High School Class of 2018 graduate Samantha Gowin stressed over her future after graduation, English teacher and Advancement Via Individual Determination (AVID) coordinator Cesar Castellanos always found the right words to instill confidence and ease her mind. Castellanos’ reputation for constantly supporting his students in and out of the classroom and empowering them to realize their dreams of attaining a college education has earned him El Monte Union High School District’s highest honor: 2018-19 Teacher of the Year. He was recognized in front of his peers during the District’s annual Opening of School program on Aug. 14. 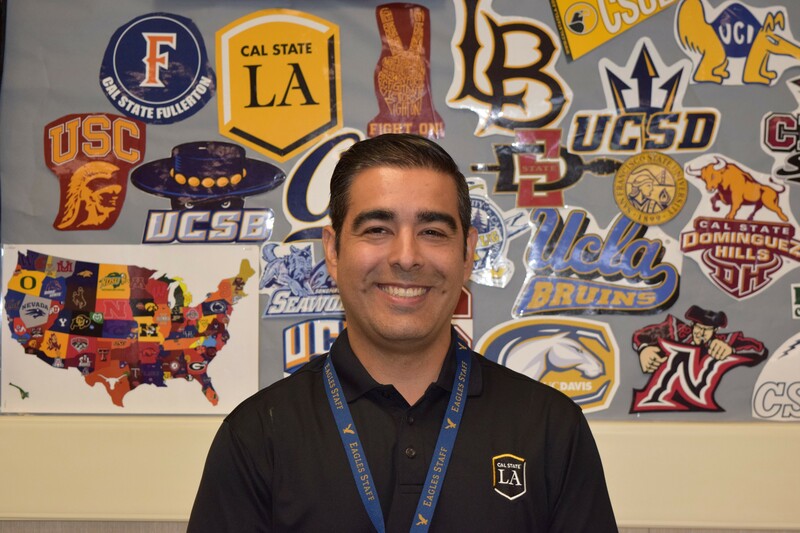 Castellanos, a graduate of Rosemead High School, joined El Monte Union in 2011, teaching at El Monte High School for two years before moving to South El Monte, where he has served as the school’s AVID coordinator since 2014. The elective class helps traditionally underrepresented students forge a path to college by boosting their study skills and offering academic, social and emotional support. 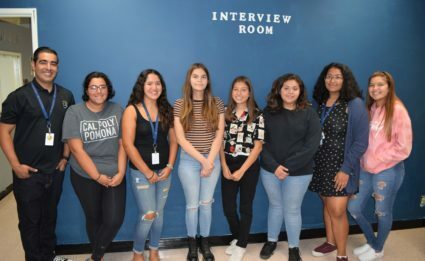 South El Monte Class of 2018 graduate and first-generation college student Samantha Rodriguez, a freshman at UC San Diego, was amazed at how quickly Castellanos was able to connect with his AVID students and make an impact on their lives. Castellanos’ dedication to his students doesn’t end when the bell rings. Castellanos spends many hours fundraising to help pay for annual AVID student field trips to universities across California, including Stanford, UC Berkeley and UC Santa Cruz. He has also helped to expand the school’s AVID program by regularly recruiting students at feeder middle schools. He also heads the school’s new Early College Academy, in which students have the opportunity to earn college credits through Rio Hondo College. Castellanos wants to ensure nothing stands in the way of his students attending college, whether that means raising money for a dorm room deposit or paying a college application fee out of his own pocket. Castellanos also teaches journalism and advises the staff of the school newspaper, the Eagle’s Nest. In December 2017, Castellanos received the Bobby Salcedo Esperanza Award, given to outstanding educators who exemplify a tireless commitment to education, including mentoring students facing hardship and inspiring them to pursue a college education. 090718_EMUHSD_CASTELLANOS1: For his dedication to helping his students realize their dream of going to college, South El Monte High School English teacher and AVID coordinator Cesar Castellanos was recognized as the El Monte Union High School District 2018-19 Teacher of the Year. 090718_EMUHSD_CASTELLANOS2: South El Monte High School English teacher and AVID coordinator Cesar Castellanos was recently recognized as El Monte Union High School District’s 2018-19 Teacher of the Year. Considered by many students as a father figure, Castellanos also serves as SEMHS journalism instructor and adviser for the school newspaper, the Eagle’s Nest. South El Monte High School English teacher and AVID coordinator Cesar Castellanos was recently recognized as El Monte Union High School District’s 2018-19 Teacher of the Year. Considered by many students as a father figure, Castellanos also serves as SEMHS journalism instructor and adviser for the school newspaper, the Eagle’s Nest. For his dedication to helping his students realize their dream of going to college, South El Monte High School English teacher and AVID coordinator Cesar Castellanos was recognized as the El Monte Union High School District 2018-19 Teacher of the Year.